The master bedroom of the Chairman's suite, Venetian Las Vegas. One palatial entertaining space at the Laurel Collection Garden VIlla Caesar's Palace. The living dining area of the Chairman's suite. The Venetian Las Vegas. The outdoor lounge area of a garden villa. With plunge pool of course. If you have heard rumours of the opulence that used to be thrown at Kerry Packer in Las Vegas and have always wondered what it looked like, hold on. They don’t have a price tag because the people who stay in them don’t pay but play. And play big. So big the casino will do whatever it takes to get them there. And the extent to which the butler team will go to is the most surprising, when I get talking to the head of the butlers at Caesars Palace, Christian Brosius. Before the ‘Whale’ arrives the butler team will call the staff of the gambler to get a full run down of their preferred patterns, foods and everything in between. For example, Christian tells me they have more kinds of toilet paper in their storeroom than you can imagine. Seriously, toilet paper? Yep, they try to find out what kind of toilet paper the Whale prefers. Fragrances, deodorants, alcohol, cigarette brands, when the Whale likes to sleep or eat. It all goes into a database for the butler team to access and set up the villa or suite to the Whale’s preferences before they arrive. He was not going to confirm but merely smiled and said there are many different requests that are not really considered ‘mainstream’ but if it’s within the realms of “moral acceptability and legality” then sure. That’s a lot of scope in this city. The opulence of the suites, furnishings and freebies are as you would expect: spectacular. Opened in October 2012, the Garden Villas at Caesars Palace are meticulously designed three-bedroom villas. Whales get their own private pool, Tiffany light fittings, a pool table, hand-painted murals and a media room with a 103-inch plasma. 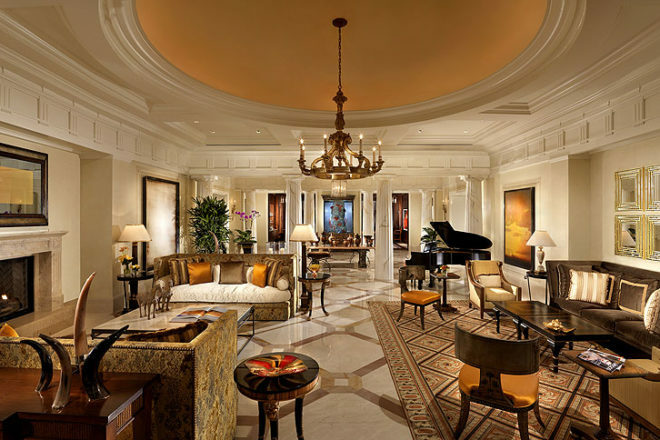 Over at the Venetian, the Chairman’s suite is four bedrooms of over the top lavishness. The media room is huge, a round dining table that seats 10, a private hair salon and massage room with full treatment equipment. And how often do the whales come? Well, Christian says the occupancy for their new Garden Villas is running at 70 per cent. And of that, it’s mainly mainland Chinese ,which is why 70 per cent of the butlers are fluent Cantonese or Mandarin (or both) speakers.